Kyle Anderson, & Robin Givhan. The Fashion Group International (www.fgi.org) held their Ready-to-Wear Trend Presentations for Fall/ Winter 2017 on Monday. The event was sponsored by Ecco Domani, MAC Cosmetics, LIM College and Hearst Magazines, which explains the venue: the Hearst Tower Screening Room. As always, the audio visual presentation was edited and narrated by Fashion Group’s Creative Director Marylou Luther, who does a superb job of highlighting the best of the best and singling out the most important trends from the runways of New York, London, Milan, and Paris. Even though we have all seen the collections, putting it together this way and at this time, allows us to see it from a different perspective and with a little more perspective. Plus, her slides are fabulous. At the end, she summed it all up with her list of “Best Bets”, those items most likely to translate successfully from the runway to reality this season: The Shearling Coat; The Leather Jacket; The New Inflation (puffers); Layering; Racing Stripes; Denim (the entire category); Animalia (leopard is especially strong); Red and Blue; Day and Night (day for night and night for day); The Beret; Crystalled Boots; The Pump; Jewelry’s New Key (key themed accessories); Hooping the Ear; The Structured Bag (which I wholeheartedly agree with since I was carrying my slouchy oversized Maison Margiela bag yesterday and it took me one hour to find my camera, eyeglasses and my keys lol). I attended the noon time presentation which was followed by what is always a lively panel discussion. 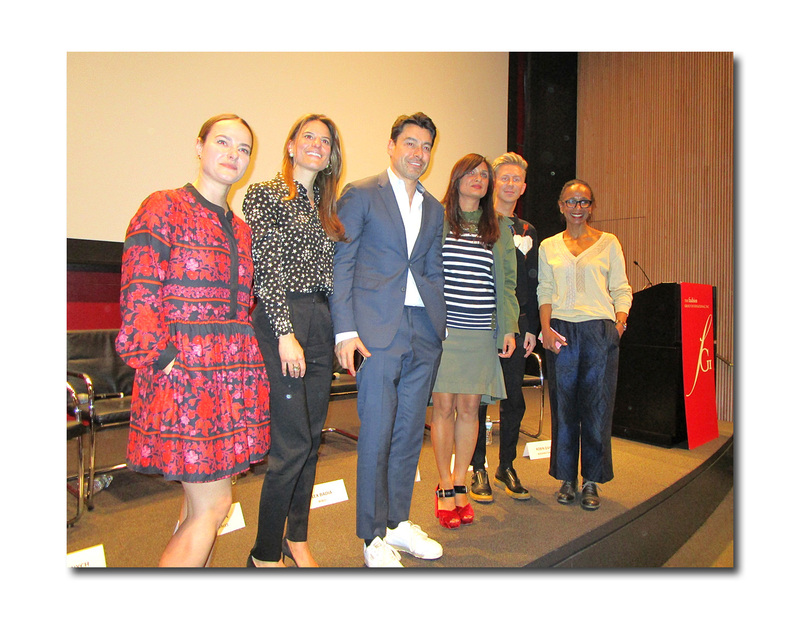 This year’s Special Guest Moderator was The Washington Post’s Robin Givhan, and for the 1st time ever, Alex Badia, WWD’s Style Director reported on men’s collections shown on runways in tandem with women’s. The panelists: Kyle Anderson, Marie Claire; Sophia Panych, Allure.com; Brooke Jaffe, Bloomingdale's; Roopal Patel, Saks Fifth Avenue. Among the topics the Pulitzer Prize winning, and “inestimable” (in the words of Marylou Luther, who is no slouch herself, having received the French Government’s 2008 Chevalier of the Order of Arts and Letters Award) Ms. Givhan wanted to focus on: the impact of the current political situation on fashion; the empowerment of women; the new diversity (racial, ethnic, gender, body type) on the runways; the growing importance of menswear; buy now/wear now. She made a point of saying that the panelists had not heard the questions prior to Monday’s discussion. Robin Givhan (RG): How do you feel about the focus on politics within fashion? Does it speak to your readers or customers? Alex Badia (AB): Yes. A lot of young designers want a voice. Everyone wants to be heard. Roopal Patel (RP): The designers used the runways in New York as a platform to express themselves. It was perfectly timed as it followed on the heels of the Women's Marches and the designers seemed intent on offering empowering fashion choices for women. For example, there was a return to power suiting. Brooke Jaffe (BJ): There was no shortage of ideas this season. It’s all about choices. You can choose what it means to be an individual. Sophia Panych (SP): The beauty, hair, and makeup on the runways were an expression of individuality. The beauty and makeup artists are breaking down walls. Kyle Anderson (KA): Designers here stepped up their game on every level. It’s about freedom to express the message they want. RG: How do you feel about the emphasis on diversity (ethnic, racial) this season? SP: Sending an army of girls with the same hair and makeup seems so outdated now. We can’t go back to the way it was before. I have written a trend report for 7 years. There are big moments that send a message. Right now, it’s a celebration of unique beauty and individuality. RG: What about diversity in terms of sizes (and plus sizes) on the runways? RP: There were so many real people on runways. It’s much more acceptable. So many more customers can now relate and connect to what she sees on the runway. BJ: Indeed and we will need to market differently. RG: What was most inspiring for you this season? RP: It’s all about real people. There were different sizes, shapes, ages on the runway at Dolce & Gabbana, and at Gucci, it was an eclectic bunch. Everyone is invited to Alessandro’s world. It’s all about authenticity and being real. BJ: The Gucci store is the most packed one in Milan. There’s a continuity and seamlessness from one season to the next with Alessandro. You don’t feel like you’re in last season’s Gucci. KA: The ‘Gucci Effect’ has infiltrated all other designers. Models years ago looked identical regardless of their race. It’s so different now. RP: You can’t underestimate the influence of Demna Gvasalia (who began using nontraditional fashion models) in leading the way in terms of individuality on the runway. He changed the idea of beautiful with his endorsement of “Geek Chic”. Fashion used to be just about the clothing. But now it’s so much more. BJ: Yes, but there is still that “Gigi-Kendall” effect which is still going strong. There is still this want for those beautiful, IT girls at the shows. RP: Isn’t fashion big enough to have room for all of it? KA: The big designers want the most unusual in terms of models. Balmain was the most social media focused show and his use of the IT girls (Gigi, Kendall) was part of that. RG: Is social media as important in transforming the look on the runways in terms of menswear? AB: Some shows are media focused but not all are as focused. RG: We’re definitely in a menswear moment. What do menswear designers need to understand about their customer? AB: The boundaries of menswear are wider and there is unchartered territory to conquer. The NBA players had a lot to do with it. Sneakers have been an incredible catalyst for men (the high profile Nike collaborations for example). All of a sudden you have a whole new consumer who is very engaged. But don’t be fooled into thinking that men are the new women. It’s just that men are the smarter men. Before men used to have an everyday shoe and a dress shoe. They now understand that there is such a thing as the “shoe wardrobe”. It feels very exciting. That’s why there is such an investment in menswear. But of course, it’s never going to be womenswear and you can’t possibly compare it. RG: Who do you see as the most influential, important menswear designers? AB: That’s a tricky question. Whether you like him or not, Yeezy has had a major influence. Also, Demna Gvasalia of Balenciaga, whose streetwear is so important. And you see Tommy Jeans and Tommy Sport all over the streets. Tommy Hilfiger has had a major impact on street style. But you need to put it all in perspective. There are different leaders. RP: We now call men ‘the new women’ at Saks. In fact, we recently opened a beautiful new store, Saks Downtown Men’s (it’s in Brookfield Place in the Financial Center). There has never been so much choice. They are finding a new experience in shopping. RG: How do you feel about men and women being on the runway at the same time? KA: It seems natural. There is more of a connection now, between the two. AB: I’m unconvinced. For women’s shows, it’s about a universe. For me it feels like a side note. I like the separation. It’s too watered down otherwise. Pitto Uomo (in Milan) is great for entertainment value. RG: See now, buy now. How do you see it? RP: Tommy & Gigi, Ralph’s 1st show (for fall 2016), Burberry. When digital and social media comes together it works. If Gucci had a “see now, buy now” for accessories, everything would sell out. The Saint Laurent crystal boots: we had wait lists the day the show happened. They were sold out. The reality is that if there’s a great product, the customer is willing to wait. I don’t think it’s the savior for fashion, but it makes sense when it works. RG: If it’s really great, people will take it now, or they will wait 6 months. KA: It worked for Michael Kors’s spring/summer 2016 show last season. There were a few cute capsule pieces; the “Love’ shoes, sweater, etc., that you could buy and wear right then. Proenza Schouler also did a few good pieces. You could buy that one good sweater or bag right then, but you didn’t have to commit to more pieces until later. RG: Athleisure. How much longer? BJ: It’s here to stay. It’s the elevation of Athleisure, such as Raf Simons’ track pants for Calvin Klein. They are track pants but elevated. RP: I agree. People connect with it. RG: What designers most impressed or delighted you this season? KA: The Coach show in New York and Gucci in Milan. Everything goes together but it’s so weird. It was THE show! RP: Calvin Klein for great American sportswear; Gucci (its Alessandro’s world; inclusive) and Prada (it was diverse; all about empowering women); Balenciaga in Paris. AB: Saint Laurent. I want to be friends with that girl! Also, Dries Van Noten, and the men’s section of Calvin Klein. BJ: Calvin Klein in New York (especially the jeans); Fendi and Max Mara in Milan (it was one of their strongest shows). SP: In terms of beauty and makeup, I’d have to say Prada, Saint Laurent, Martin Margiela (she cited the diversity of the hair and makeup on the models), and Marco De Vincenzo is always a highlight for us.